Today is the last recipe I’ll be sharing this year. Looking back over the past 12 months, I have to say this year has been the best example of what can come if you work hard and are open to anything that comes your way. I’d be lying if I said this year didn’t come with its share of hardness, but overall, it’s been a year. I know I’ve said it before but I appreciate each and everyone of you that reads, comments, and make the recipes. I’ve got some exciting things coming up in the new year that I can’t wait to share! This recipe is one of my new favorites. I love noodle/rice bowls. I also have a new love of all things nut and seed butters. My mornings are often started with a bagel smothered with sunflower seed butter and in place of the peanut butter, I’ve been using more and more tahini. I’ll make a big batch of these noodles and eat for a week of lunches. If looking to make this vegan, simply leave out the honey or use a different sweetener. For Gluten-free, use a gluten-free noodle (I love the brown rice noodles) or create a simple brown rice bowl. Preheat oven to 400 degrees. 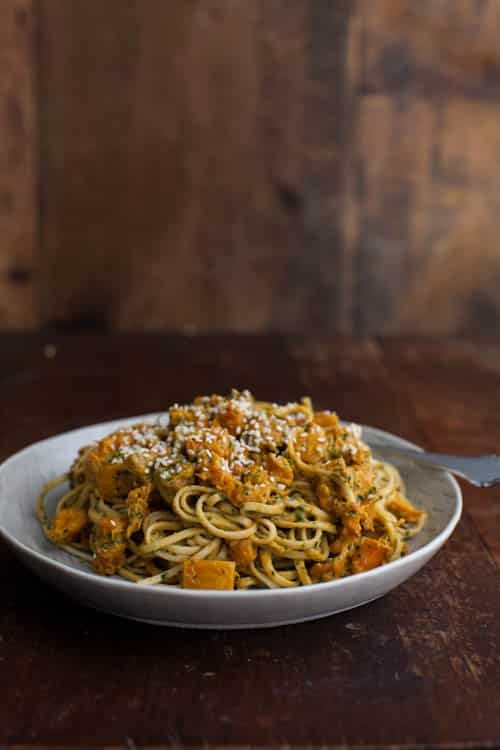 Toss the cubes of butternut squash with olive oil. Spread out on a baking sheet covered with parchment paper. Roast the squash until tender, 25 to 28 minutes. While the squash cooks, bring a pot of water to a boil. Add the noodles and cook until tender, 4 to 5 minutes. Drain the noodles and rinse with warm water. Place noodles in a bowl. In a food processor or blender, add garlic and peeled ginger. Pulse until broken into small pieces. Add cilantro, pulsing again to chop. Then add the tahini, soy sauce, lime juice and honey. Pulse until sauce comes together and is well combined. 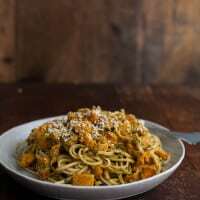 Once the butternut squash is done, add it to the noodles. Pour the sauce on top and toss until the noodles and squash are coated. Finish the noodles with a sprinkle of toasted sesame seeds. Happy New Year Erin! This is my kind of noodle bowl. Love the Cilantro Tahini sauce. Cheers to 2014 and more delicious recipes! Totally with you on the nut butter – nut butters are my favorite snack. I used lather them on celery and toast and stick them in smoothies but I’ve gotten to the point where I just eat a spoonful for a mid-morning boost everyday. Oh yum, this looks wonderful! I loooove cilantro and butternut squash. I’m thankful 2013 was the year we got to meet you. So excited for your book next year and for all the good things I know you’ll be cooking until and after then. Glad to know you, E.
Get it girl!! I am SO thrilled with the makeover you guys gave to my blog this year and will be forever indebted to your genius. It is amazing and makes me happy every day. So happy for you for all you have achieved!! This sounds amazing. I love Asian noodles and tahini, too! I’ve never tried sunflower seed butter but I do love seeds, so I should probably give it a whirl! Love this recipe and so glad I stumbled on your blog this year! Happy 2014!! 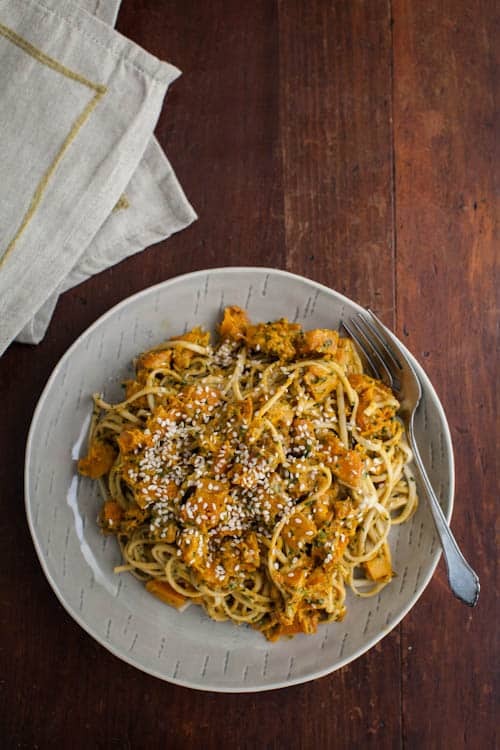 Winter squash and tahini is a match made in heaven! I can’t wait to try this recipe. I’ve made pasta before with cubed, roasted butternut squash and spelt pasta, and made a “dressing” with olive oil, garlic and herbs. I really like the idea of making it creamy and asian-inspired. I’ve never tried udon noodles before, so I’ll have to look for them next time I’m at the shop. Thanks for the inspiration. Happy new year! Thank you for this recipe! I love squash and tahini, so it’s perfect. I’ve made it a few times now and it’s been well recieved. Last time I didn’t have any udon, so subbed with some dangmyun (Korean sweet potato starch glass noodles) and it came out very nice even if it was more chewy! This is one of my favorite recipes to make! It’s simple, full of flavor, and delicious-the best kind of dish to make after getting home from a long day of work. And for that matter, all the recipes I’ve made from this site fit that profile.